Welcome back! Today, I am starting a new series of posts about my favorite things. Over the next several weeks/months I will share some of my favorite things with you, along with links of where you can pick them up for yourself should you want to experience their awesomeness for yourself! Today I am going to focus on my favorite pens and a couple of my favorite office supplies. 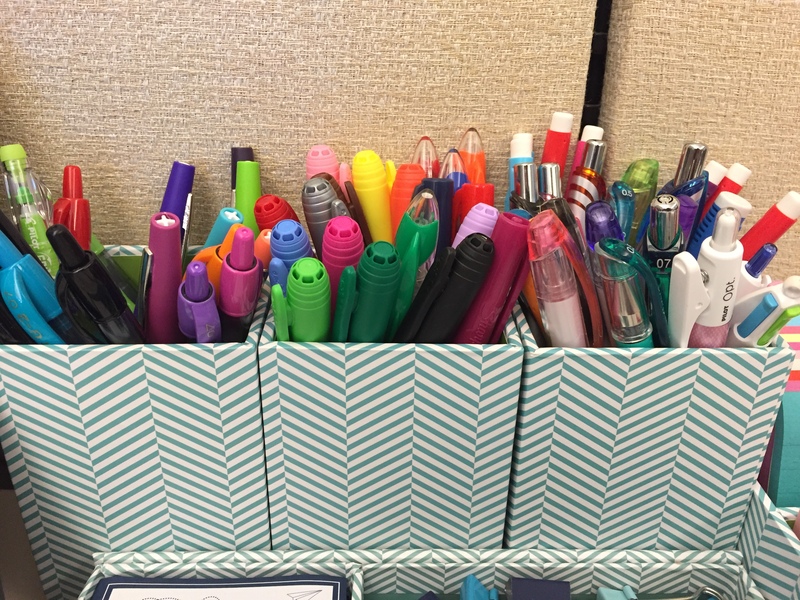 Anyone who has worked with me knows about my office supply love. I don’t exactly keep it a secret. Why have one cup with pens when you can have three or four! 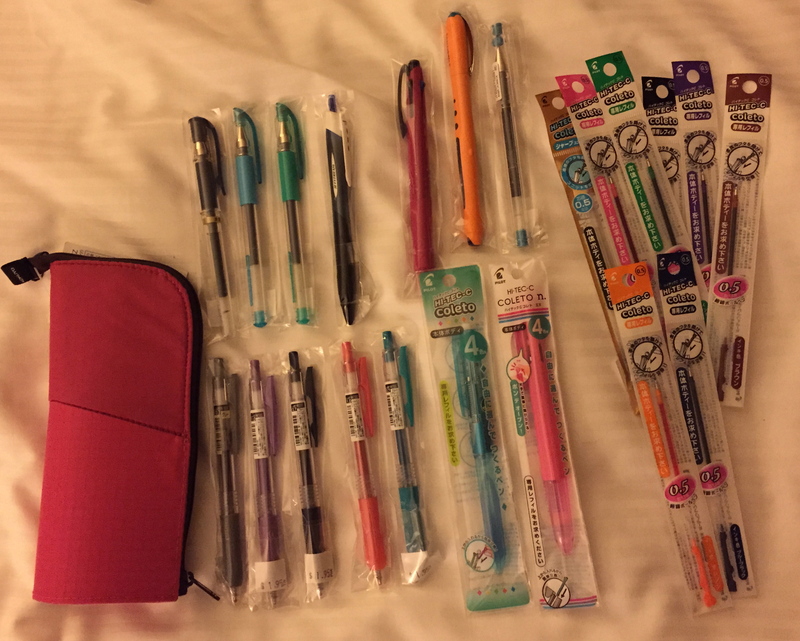 Through this awesome group I learned about Tokyo Pen Shop and JetPens. It is just a fact that some of the best pens on Earth come from Japan. 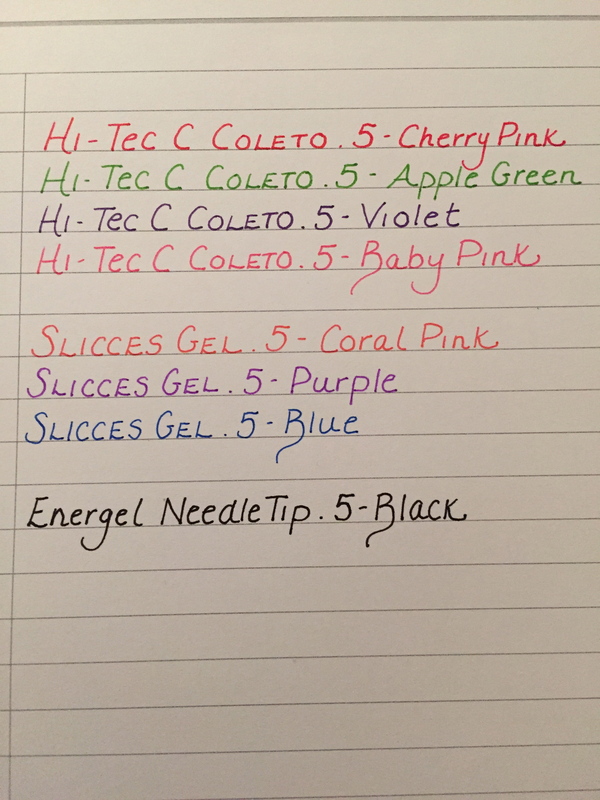 The different ink types, colors, points. It all makes me swoon. For my 40th birthday, Mike and I took an overnight trip to New York City. 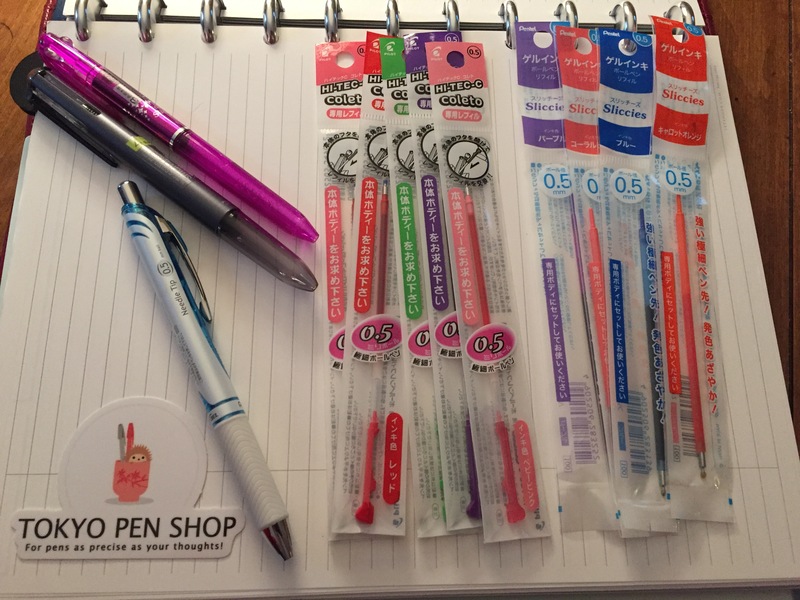 I have to admit that one of the main reasons I wanted to go to NYC was to visit some amazing stationery stores that I had heard about through the Pen Addicts group. I should mention that we are only 3.5 hours from NYC so we can visit multiple times a year if we want..so that helps! The highlight for me, besides the amazing meal we had at Charlie Palmer Steak (steak is definitely a favorite thing! ), was a visit to the Kinokuniya bookstore. Oh.em.gee. This place was amazing. Mike gave me time to just stand there and stare at the awesomeness. And I did…for probably 10 minutes before I actually started to test out pens. Oh, how I wish I had taken a picture of the displays. Sounds like we will need to head back soon ;-). Here is a picture of the loot that I picked up on that visit. It made my heart happy. I was able to try out different types of pens and learned what I like about each. As a result of that “research” I knew exactly what I wanted to order in my last Tokyo Pen Shop Order. And here is what arrived today! It kind of makes me excited to take notes at work tomorrow 🙂 And speaking of taking notes, I would be remiss if I didn’t share my favorite notebook. Well, actually it is a notebook system. It is by a company called Levenger. Oh, how I love this company. Yes, it can be pricey but they regularly have coupons they email you and gifts with purchase. Staples has their version of the notebook and I do have some of their products mixed in with the Levenger ones. 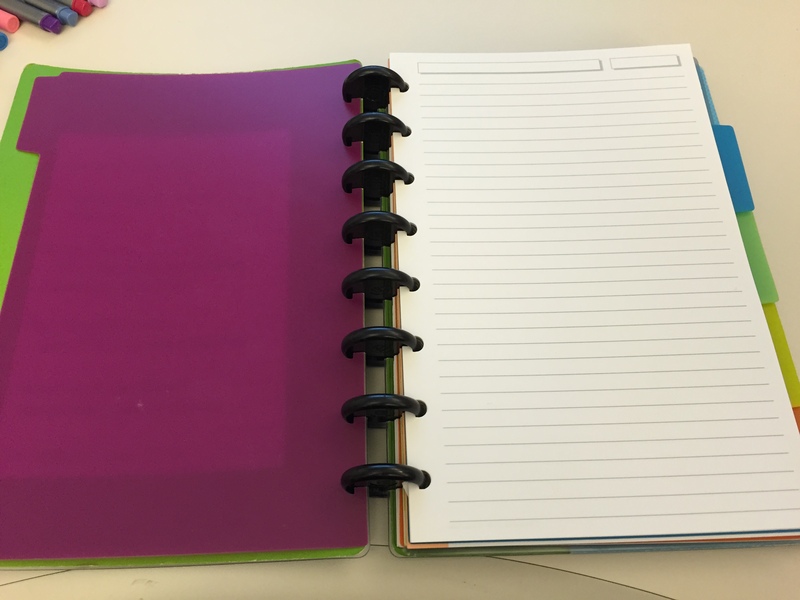 But…the Levenger paper is definitely superior and I have little concern with my pens bleeding through. The pens in the picture above are resting on my large, portfolio Levenger and here is a picture of the smaller version I have as well. Yes, I might have a problem but I am willing to admit it! Ok, so there are some thoughts on a couple of my favorite things. Let me know what you think about my recent purchases in the comments below. Til next time! I love pens, too, Jen. Being a New Yorker, and a student of Ikebana, I became aware of all things Japanese. They have a love for beautiful presentation. It shows in everything they do and everything they create. If you did not know about, Paper Presentation on West 18th Street, there is another shop you would love. It is like being in paper heaven. After all, don’t you want beautiful papers for your beautiful pens. I have used Levenger products, most especially their paper products. I agree with you. They make top quality stationary and journals. Hi Wendy! Thanks so much for your comment. I will definitely check out Paper Presentation the next time we are in New York. I adore paper. I make greeting cards and invitations so I am always looking for beautiful paper. Great post! I’ll have to check some of these pens out.